Okay, maybe changing one’s career, living arrangements, school, hairstyle, doctor, etc. doesn’t physically hurt, but it sure is uncomfortable. And that’s the position I found myself in last year (2012) when my then editor Goldie Browning told me my book, Fuller’s Curse was a horror book. That news disappointed me for two reasons: one, I had not intended to write a horror book; I was striving for literary or mainstream fiction; and two, I had spent over ten years in the romance genre and did not want to venture into another genre. So to help me with my change from romance writer to horror writer, and to help me examine some of my preconceived ideas about horror writing, I began researching the horror genre and guess who I found—Sumiko Saulson. Sumiko titles herself a horror novelist, but in addition to novels, she writes short stories and comics (isn’t that cool?). 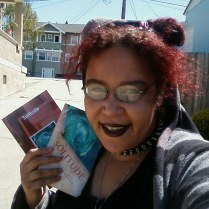 Beyond her computer, she speaks at horror writing/reading events and blogs about the topic. I’d go so far as to say she lives and breathes the genre. Others have labeled her “one of the most active women in horror” and she is an Ambassador for Women in Horror Month. In short, she’s the expert I’d been searching for. I explained to Sumiko that I needed an intro to the horror genre and she eagerly agreed to share what knowledge she had which turned out to be a lot. So much so I can not share her entire interview here, however the highlights appear below. I hope you enjoy learning about this genre as much as I did. Ann: As an insider in the horror genre, how do you define horror? Sumiko: Horror is simply writing intended to frighten the reader and tap into some deep and primal instinct of fear. Reading, and for that matter, writing horror is kind of like riding a roller coaster; it’s an adrenaline rush. Many horror writers, like Edgar Allan Poe and me are also exorcising personal demons with our writing. Like Poe, I was originally a poet. I tried to write non-horror fiction, but it’s not what tends to exude from my mind or my fingertips, so for me, horror was almost a default setting. Ann: What are some of the misconceptions about the horror genre that you encounter? Sumiko: Very frequently women will tell me “Oh, I don’t read horror” shortly after finding out that I write in the genre. Sometimes the same people will read something I’ve written and say “Oh, well, this is very good for horror” or “I was surprised I liked it.” Frankly, the gender bias is strong, especially for women. People have the tendency to think writing or reading horror is unladylike or undignified and so a lot of women want to disassociate from the genre; it’s just not something “nice girls” do. The other side of it is people – in this case usually men – who think women can’t write horror because we are so soft and dainty. But I think horror is something intrinsic to the human experience and it is not actually gender specific. Mary Shelley was said to have been inspired to write Frankenstein during a period of mourning over a failed pregnancy. Horror often allows the writer to process the terrible things that can happen while touching on some of the bigger questions, such as in Shelley’s case: whether or not we should be attempting to create new life from the dead. Ann: What value does horror writing add to the literary landscape? Sumiko: Horror, like all speculative fiction, allows the writer to explore subjects that the reader might be uncomfortable confronting head on. These can include political questions such as in Stephen King’s “The Stand” when the reader is forced to question whether or not we should trust government to experiment with biological weapons, or like Mary Shelley’s religious question from above: should we play God? By creating some distance between the world we live in, both horror and science fiction allow us to examine these questions without having things hit too close to home. A lot of people noticed Gene Roddenberry doing this with Star Trek in the 60s when he used alien species to create parables and fables regarding contemporary issues such as racism, interracial romance, and the Cold War. Ann: It sounds like there are some genres that lend themselves more readily to cross-pollinate with the horror genre. If you agree, what are they? Can you share some examples of cross pollination that worked well? Sumiko: The reason the “Speculative Fiction” umbrella emerged was because of the close relationship between science fiction, fantasy, and horror. You see that when you read something as old and established as Mary Shelley’s “Frankenstein.” Both science fiction and horror genres are eager to claim the work, and it is frequently named as an early example of women in horror and in sci-fi. We see a lot of paranormal romances these days which combine the supernatural element generally associated with horror with romance, and in some cases, like the L.A. Banks vampire slayer stories, actually can be considered horror or urban fantasy as well as paranormal romance. Then, of course, dystopic and apocalyptic themes are seen across multiple genres. You see that in Robert Neville’s “I Am Legend,” which includes apocalyptic, science fiction and horror themes. Ann: Why should a reader try a horror book if they’ve never read one? What books do you recommend for “new” horror readers? Ann: What are some trends in the horror genre? Sumiko: Paranormal romance has become extremely popular lately, and it seems to appeal to women of all ages. We have stories about girls romantically involved with vampires, werewolves, zombies, and Bigfoot. A lot of these stories are more like erotica and romance and less like horror, but you do have some where the world the characters live in – like L.A. Banks’ “Vampire Huntress” series or the latest Anne Rice “Wolf Gift” series – falls into the horror genre. The identification of the work as a part of the horror genre has to do with the presence of real threats, real danger, and generally real harm occurring to characters within the stories. Where there is no risk, there is no horror, because there is no danger to be terrified of. And on those insightful words, I ended my interview with Sumiko Saulson, the author of “Solitude,” “Warmth,” and “The Moon Cried Blood.” A big hug and thanks to Sumiko for sharing her knowledge and time. To visit her online, go to www.sumikosaulson.com.